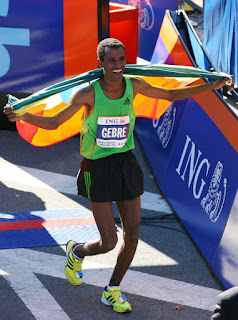 writing about running: NYC 2011: Can Gebremariam hold off the Mutais? Gebre Gebremariam put on a show last year in New York and made a mockery of the competition, and the Marathon in general, with a big win on "doubled 10k training." In his debut, on arguably the most challenging Marathon Major course, Gebremariam was flawless. The 2010 runner up was Kenya's Emmanuel Mutai, who is considered one of the favorites again this year. Mutai also will have the weight of making the Kenyan Olympic team on his shoulders, something that will be a very tight competition within the competition. Since NYC 2010, Gebremariam has seen some challenges and the Marathon has seen some changes. 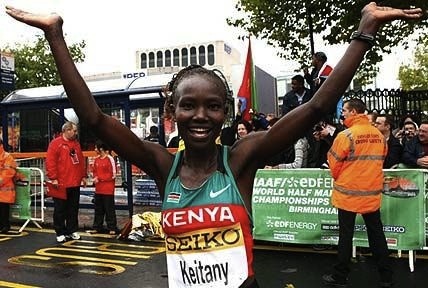 Multiple 2:03's have been turned in, and Kenya has taken to the forefront, dominating the 2011 World Championship Marathon and leaving Gebremariam's Ethiopian countrymen in their wake. The biggest question about the 2011 NYC Marathon has got to be, will the Kenyans go out at a breakneck pace on the challenging NYC course? If they do, will Gebremariam and his countryman, Tsegaye Kebede, go with them? Can someone run in the 2:05 range on the NYC course? And can Meb Keflezighi run under 2:10 in a pair of Skechers? Geoffrey Mutai will likely lead the Kenyan charge with former Galen Rupp American 10k Record Attempt-pacer, Matthew Kisorio, making his Marathon debut after a strong 2011 track season in tow. Expect both Mutai's to set the pace with Kisorio right on their shoulder, with Kebede and Gebremariam right in the pack. It's going to be quite the show, and luckily, we can watch it on Universal Sports, UniversalSports.com (for free) and the Marathon Mobile App starting at 9am eastern. Finally, on the American front, Meb Keflezighi is taking a big risk running NYC so close to the 2012 Marathon Trials, but as a return champion, who is likely getting a very nice appearance fee, can you blame him? This will be his first Marathon as a member of Team Skechers, and it will be interesting to see what he's got in the tank. He ran great at the San Jose Half and I don't think he'll fall out of the top seven. It's hard not to get excited about the debuts from Bobby Curtis and Ed Moran as well. Both have been great 10k runners and will look to make the Olympic Team in that event, but both should battle for top ten finishes tomorrow, as they likely will run more within themselves than some of the pack upfront, and will pick off stragglers as long as they respect the Marathon! On the Women's side, last year's bronze medalist, Mary Keitany, looks to be the cream of the crop. Keitany finished behind Edna Kiplagat and a strong finishing Shalane Flanagan, in her debut, then went on to win the 2011 London Marathon in a very fast 2:19:19. 2011 Boston Marathon winner, Caroline Kilel, is a proven hill runner and could emerge if the late hills of Central Park slow Keitany. Also, Kim Smith could do something special as long as she doesn't try to run away from the field early, like she did in Boston. The three will likely run together and then make a go of it in the last 10k. On the American front, the most exciting debut is certainly Lauren Fleshman. Fleshman is a runner's runner and is easy to pull for. She's been battling some injuries, but appears to be a perfect fit for the stage of New York. Let's hope she wakes up feeling good and can run the race competitively. Also in the field is the ageless Jen Rhines. Rhines can do it all and I would expect nothing less than a top ten finish from her. She's strong, consistent and well trained for a course like New York. USATF 25k Champion Molly Pritz rounds out the showcased debutantes, and should be capable of something in the 2:30-2:32 range.